Defense contractor Kratos Defense & Security Solutions said it completed the second flight of a self-funded project to build a jet-powered tactical unmanned aircraft system. The November 23 flight at the U.S. Navy’s China Lake, Calif., test range was a collaborative exercise with an AV-8B Harrier strike fighter, the company said. 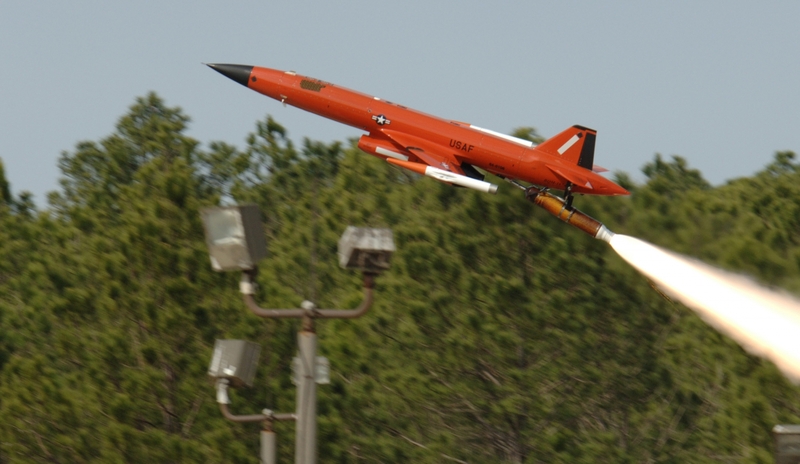 San Diego-based Kratos, which manufactures aerial targets for the Navy and the U.S. Air Force, describes its Unmanned Tactical Aerial Platform (UTAP-22) as a high-performance jet designed to survive and to operate or deliver payloads in hostile environments. The company reported completing a first flight of 94 minutes’ duration at China Lake as part of its third-quarter Fiscal Year 2015 financial results, a period that ended in late September. It plans three test flights. The second flight involved “collaborative airborne operations” with a Harrier and demonstrated command and control through a tactical datalink; autonomous formation flying with the AV-8B; transfer of UTAP-22 control between operators in a tactical network; and transfer of control from the network to an independent control link. “The results from this demonstration flight validate the unprecedented ability for a low-cost, unmanned aircraft with fighter-like performance to operate collaboratively with a manned fighter/tactical aircraft through semi-autonomous tasking and autonomous formation/wingman modes,” Kratos said on December 3.